Oregon College of Oriental Medicine (OCOM) is one of the first acupuncture and traditional Oriental medicine institutions in the United States, with more than 30 years of experience teaching, guiding and advancing wellness. Located in the beautiful Pacific Northwest, OCOM trains master's and doctoral students in acupuncture and traditional Oriental medicine by integrating classical theory with a modern, practical approach to health and wellness. Our programs offer a wide-ranging, hands-on course of study that incorporates acupuncture, Chinese herbs, nutrition, Oriental therapeutic massage (shiatsu, tuina), and a fundamental approach to qi cultivation (qigong, taiji quan) for a comprehensive understanding of this transformative medicine. OCOM students are also uniquely positioned to enjoy the region's bountiful mix of recreational opportunities and natural beauty - ocean beaches, snow-covered alpine peaks, dense old-growth forest, rushing rivers, high desert - all within a 100-mile radius of Portland. Fans of cycling, thriving arts scenes, sustainable development, organic foods, crafted microbrews and local wines will find a home here. Portland is consistently ranked among the most livable cities in the country. OCOM's Master of Acupuncture and Oriental Medicine (MAcOM) degree program trains highly competent health care practitioners and provides the foundation for ongoing study and development in the field. Coursework and training in all aspects of traditional Oriental medicine is presented, including the theory and practice of acupuncture, herbal medicine, therapeutic massage (shiatsu and tuina), nutrition, exercise and qi cultivation. The study and practice of qigong is integrated into all aspects of the curriculum. The Doctor of Acupuncture and Oriental Medicine (DAOM) degree program provides an opportunity for practicing acupuncturists to gain in-depth knowledge of advanced topics in both Oriental and Western medicine. The heart of doctoral education at OCOM is the development of lifelong learners and scholars. The DAOM degree represents the highest formal education credential available in the field of acupuncture and Oriental medicine in the United States. In 2005, OCOM graduated the nation's first cohort of DAOM students. OCOM's early application deadline is January 15; applicants submitting completed applications by this date receive a waiver of the $50 application fee. After May 15, applications will be accepted and processed until the incoming class and waiting list are full. Increasingly, OCOM classes are filling earlier in the year. Prospective students are encouraged to apply as early as possible. Students are eligible to apply for Federal Financial Aid (through subsidized and unsubsidized Stafford loans) and a number of scholarships offered through the College. OCOM offers monthly Admissions Seminars on its Portland campus, as well as quarterly Virtual Seminars for prospective students who are not able to travel to Oregon. 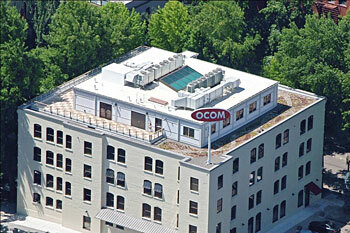 In 2012, OCOM moved to a new campus in Portland's historic Old Town Chinatown neighborhood. The new location doubles the space available for student instruction, and places OCOM in the heart of the city. OCOM's neighborhood is home to a number of the college's community partners - including Lan Su Chinese Garden and the Northwest China Council - and community clinic partners. OCOM owns and operates three clinics in Portland - the OCOM Clinic on our main campus, the OCOM Hollywood Clinic in Portland's Hollywood District, and the OCOM Cherry Blossom Clinic at the location of the College's former campus. In their final year of study, OCOM students gain experience as interns in one of the three clinics or in one of a number of community clinics operated by OCOM partners. The College employs a nationally-recognized faculty, with 15 full-time faculty members to go along with a number of adjunct faculty who bring extensive clinic experience into the classroom. The instruction and mentoring from OCOM faculty has led to OCOM's 2012 pass rate of 93 percent*. OCOM's Research Department provides leadership, expertise and innovation in the areas of research participation, research literacy and research-informed clinical practice. The College encourage students and faculty to value research as a bridge between traditional and conventional systems of medicine. The master's curriculum includes a research course series. OCOM's Master of Acupuncture and Oriental Medicine (MAcOM) program and Doctor of Acupuncture and Oriental Medicine (DAOM) program are accredited by the Accreditation Commission for Acupuncture and Oriental Medicine (ACAOM)*, which is the recognized accrediting agency for the approval of programs preparing acupuncture and Oriental medicine practitioners. ACAOM is located at 7501 Greenway Center Drive, Suite 760, Greenbelt, Maryland 20770. Phone: 301-313-0855; Fax: 301-313-0912. OCOM has been advanced to candidacy status by the Northwest Commission on Colleges and Universities (NWCCU) at the master's and doctoral degree levels. NWCCU: 8060 165th Ave. NE, Suite 100, Redmond, WA 98052.